So, we applied for an NHS Bright Ideas in Health Awards 2015 nomination for Patient and Public Involvement a couple of weeks ago. We’ve made it through to the finals – WOW, fantastic! 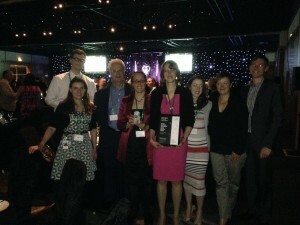 We’ve only been working on the project for about 6 months and we are in the running for a prestigious award – go team 🙂 The delivering body, NHS Innovations North, ask if they can film one of us explaining, in brief, the overview of the project to display at the start of the awards ceremony. I’m sure Kathleen or Jenny will want to take the reins on this as they do the academia/science. Ah, wait, Kathleen’s out of the country… and so is Jenny… so that leaves… me? EXCITING! Adam’s moment of glory! “No pressure Adam, but, if you screw it up we might not win the award and everyone will know about it and hate you” a small, imaginary voice warns. Good old brain shows his worth sometimes, this guidance is not worth ignoring. Taking brain’s advice, I read over some project information to refresh and to make sure I’ve got my story straight (and in the right direction). That wasn’t so bad, I knew more about the project than I thought – jolly good (note to self: trust yourself more). So where is this filming taking place? I get in touch with our contact, Rebecca, to book a time and to find out where they need me. Newcastle would seem obvious, or Sunderland perhaps? Nope. Prudhoe. No, really. They have a place called “Fuse Media Centre” which has facilities to film me, even if Google Maps’ street view disagrees. Well, even if someone is having a laugh at my expense, it’s a nice sunny day to be walking up one of the many hills in Prudhoe. Ah-ha! Prudhoe DOES have filming facilities. 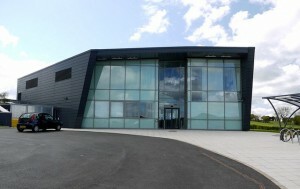 Fuse Media Centre is real and looks pretty impressive (take that, Google Maps’ street view). I walk through the big, glass doors to find: no one at reception. I knew it, we have been lied to. No, wait, there’s a human over there – ask them if this is the correct place. It is! And he is taking me to where I will be filmed. I’m early (or the people already in there are having too much fun to let me in). No worries, I’ll hang around with Rebecca, who is also real, and has kindly provided coffee and conversation while I wait. Fuse Media Centre, Prudhoe © Copyright Andrew Curtis and licensed for reuse under this Creative Commons Licence. I admit, I’m feeling a wee bit nervous now; or is that the coffee kicking in? Well, whatever it is, embrace and go with it – the energy will come out great on screen (hopefully). Be brave. The door opens, I’m greeted by a couple of firm handshakes, and now I’m standing in front of a “green screen”. They say it’s so they can put something fun on the background afterwards when they edit the film. I ask if I can have dinosaurs fighting or some explosions behind me. No. No dinosaurs, no explosions. They humour me all the same and help me relax into talking about the project. “Don’t look at the camera” they say. But it’s a really cool camera. I just about resist the temptation (just) whilst explaining the wonders of ASTEROID. 15 minutes later they say they have all the info they need from me. They reassure me that this means I’m good at this filming malarkey. Ah, that wasn’t so bad! Now we wait until the award ceremony next week to see what I look like blown up on a 50ft screen. After a sneeze, a cough, and a few people telling me to go home, later, I have a bad case of “man-flu” (which I still have remnants of 1 month on) just in time for the award ceremony. Fantastic 🙁 I can’t go as I’m on my deathbed. “How did I come across?”, “Did the camera like me?”, “Did they put dinosaurs behind me?” are the questions haunting me to this day. Jenny, Kathleen, you were there, right? Because we are only 6 months into the project, I thought it might be a bit early to enter a Patient and Public Involvement competition, but why not give it a try. And, it was worth it! Only a few weeks later, I received the email saying we were selected as finalists and were invited to the award ceremony. It felt very rewarding putting that event in my diary :). Suddenly, we had to decide on which collaborators to list in the booklet (there are so many great people who helped us and only limited space, hard decisions! ), make a team photo, write a short bio and get ourselves interviewed by a film company. The best part was sending around invitations to the other team members :). Soon we had a list of attendees and ended up with table 36 as the ASTEROID table. Because it was my first award ceremony, I wasn’t sure what to expect. As a girl, what to wear was one of my concerns during the days before. As researcher, I decided to perform a small experiment (n=4) asking colleagues to vote independently. We concluded my pink dress was the one to be. As a proper Belgian, I cycled to the venue in this fancy dress (my bike was the only one outside the building). On the evening, we were welcomed with a drink at the Hilton Hotel in Gateshead before we were invited to find our place in the dining hall. Table 36 was waiting for us! However, our group wasn’t complete yet. Jenny only just made it! She came back from a conference in the US and after a 24h journey and a short stop at home, came straight to the award ceremony. That’s commitment! Gareth got lost on the confusing way from the metro station to the hotel, but he made it before dinner was served 🙂 Adam, meanwhile, was sneezing and coughing in bed at home :(. So, Jenny, Kristy, Stuart, Gareth, Mike, Kathryn, Caroline and I were there to approve (or judge) Adam’s moments of fame on the screen. We had to wait until after dinner before we could get a glimpse of that. Meanwhile we were entertained by some presentations and speeches about why we need bright ideas in the NHS. Along the side, they ran a small competition to raise money for Action Duchenne. Our host, Kim Inglis, invited us to a head-or-tails game. We were asked to stand up and either put our hands on our head or on our bottom, she would flip a coin and the coin would decide which half of the audience would lose the round and had to sit down. After a few rounds, about 10 people were still participating. Apparently, I was a lucky guesser and made it to the last 10. Unfortunately, that meant we had to go on stage! Was this a practice run? So, I was standing with my hand on my head and my bottom on stage. That wasn’t what I had expected from an award ceremony! Sadly, in the last round I made the wrong decision and the bottle of champagne went to someone else. Following the lovely dinner, we finally arrived at the presentation of the awards. For every category, the four finalists were introduced by a short film that was recorded earlier in Prudhoe. We had to wait a while, because PPI was only the last of six categories. But, there he was, Adam on the big screen. He did a great job. No dinosaurs, no explosion, but blowballs were twirling around behind him. He accurately explained the project with a personal touch. Other finalists that appeared on the screen were the Mental health service user led research, Durham constipation service and an Online course about falls in older people. 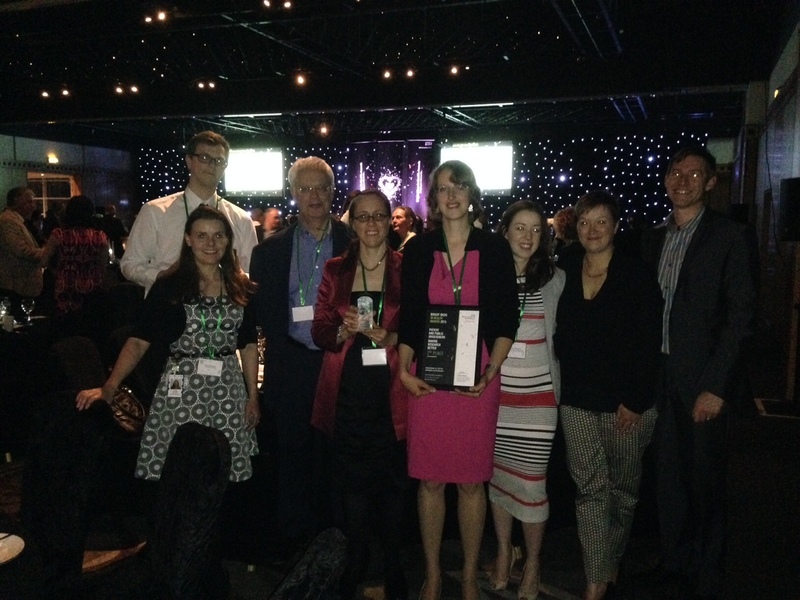 The Durham Constipation Service already won the Innovations in Research Delivery half an hour before, so we knew they would be competitive, but a 2nd place would already be beyond our expectations, so fingers crossed! After a few nerve breaking moments, they announced the 2nd place. Was that really my name, our project, which they just said?! Looking at Jenny’s face, she heard the same thing! Oh no, I have to go on stage! (Luckily I have had my practice run before). So, is the team joining me? Please, come with me, I didn’t do this by myself; I could only have done it with your support. But no, they were as freighted to go on stage as I was. So, I found myself walking to the front all by myself. Three steps to get up on stage and then just shake hands and smile to the photographer J Only back in my chair, I fully realized we have won an award! An actual shiny award! And a framed certificate J Oh, and some money would follow later, but I did not really think about it at that moment. I’ve been working on this project for just 6 months and they gave me an award, I could not believe it (still can’t). Soon after, the ceremony ended and we took some time to take a few group photos. That night I fell asleep with a big smile on my face and the award and the certificate prominently placed on my desk (although, a few weeks later they had to move to a shelf to free up space for my new desk plant).